As Europe emerges from the dark ages, the armoured cavalry have begun to employ new tactics, gripping their lances tightly under their arms as they charge, transferring the full momentum of horse and man to the point. 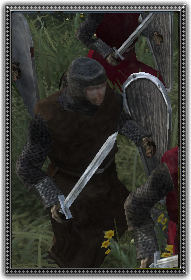 Combining heavy armour, a strong warrior ethos, and a devastating charge, they have come to dominate the battlefield. In some circumstances they need to fight on food.